If you are looking for information on the Carvel franchise business opportunity, Carvel ice cream franchises, Carvel home made ice cream franchising or icecream franchise, then you have come to the right place. In 1934, Tom Carvel borrowed $15 from his future wife Agnes, filled a battered vending truck with ice cream, and drove off in search of the American dream. The truck broke down in Hartsdale, NY, but the dream never faltered. Today, you are pursuing your own American dream, and we welcome the opportunity to share the many reasons why you should consider a Carvel franchise. Our vision is simple. 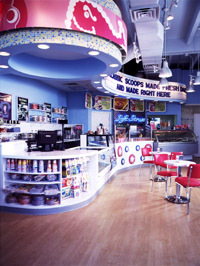 We want to be a national player in the ice cream industry, an innovator in franchising and a "best in class" employer. This is what gets us up in the morning. At Carvel, we believe in diversity and flexibility. From our franchise locations to our foodservice outlets in stadiums, arenas, airports, and turnpikes, we believe in promoting Carvel through multiple types of venues. To do this, we have assembled a team of experts in operations, marketing, design & construction, and much more, whose #1 goal every day is to assist you. Since our purchase in 2001 by Roark Capital Group, our company has signed more new franchise agreements than in the previous ten years combined. The time is right and the reasons plentiful for you to get in on the ground floor of a rapidly growing company. Together, we can create memories - for you, for your family, and most importantly for your customers. Read on to learn the many reasons why Carvel can help you realize your American dream, and create memories that will last a lifetime.